[Bài bình luận] "Emmanuel Macron’s France: “La France doit être une chance pour tous” (France must be a chance for all)"
Trung tâm SCIS giới thiệu bài bình luận "[Bình luận] "Emmanuel Macron’s France: “La France doit être une chance pour tous” (France must be a chance for all)" của ThS. Đoàn Ngọc Anh Khoa (NCV cộng tác của SCIS). Bài bình luận phân tích các đặc trưng trong quá trình gia tăng ảnh hưởng của Pháp trên quy mô toàn cầu trong nhiệm kỳ của Tổng thống Emmnuel Macron. * “La France doit être une chance pour tous” (France must be a chance for all) là slogan đầu tiên Emmanuel Macron sử dụng trong vòng đầu tiên (first-round) của bầu cử Pháp. Trong vòng hai (second round), Macron thay đổi bằng câu “Ensemble, La France”, với ý nghĩa là “Together, French”cùng mong muốn một nước Pháp đoàn kết và đa văn hóa nhằm chống lại với Marine Le Pen-lãnh đạo đảng Mặt trận Dân tộc cực hữu của Pháp, chính sách chống nhập cư (anti-migrant) và vận động cho sự trỗi dậy của chủ nghĩa dân tộc. The day after Bastille Day (July 14th, 2018), France climbed the mountain for the second time in its history, beating Croatia 4-2 in a wild World Cup final to become the champions. During the trophy presentation on the pitch, Vladimir Putin, Russian president was huddled under a giant umbrella. While Emmanuel Macron, the president of tournament winners France did not care that he was getting soaked to the bone as he congratulated his Didier Deschamps’ men. Actually, this World Cup victory has been a gift for Macron being against the rise of nationalist and anti-migrant movements as well as spread over the French soft power. When thinking of the global order, America can be the pre-eminent power whether be in military, diplomatic, economic, or cultural realms. There is an awareness that old colonial actors play some role; however, it is one that has been eclipsed from the other side of the Atlantic since at least the WWII. Recently, as America has withdrawn from the international stage, and Britain from the European one, these powers have stepped up in an attempt to fill the vacuum left behind. France, under the dynamic leadership of its new president Macron, have found themselves the remaining guardians of a global system and world order right as it faces a growing plethora of challenges from climate change to new kinds of hybrid warfare; challenges which require stability and cooperation to address. It is the foundation that has left France in a natural position to fill the void left in the international system as the American Department of State hemorrhages career employees, key ambassador positions remain unfilled. This absence and erratic behaviour has perhaps been most felt in the Middle East, a region that America has primarily dominated since the 1956 Suez Canal Crisis. The most recent incident occurred in Lebanon, wherein Prime Minister Saad Al-Hariri, whose family has links to Saudi Arabia, was summoned to the country. This crisis threatened to destabilize Lebanon, as Gulf States warned their citizens to leave and the American administration remained conspicuously silent. However, despite this lack of American leadership, the West did not remain uninvolved. French President Emmanuel Macron made a spontaneous trip to Riyadh, in which he had to face a meeting with the Saudi Crown Prince to talk about “ensuring the preservation of stability in the region.” Soon afterwards, and on Macron’s invitation, Hariri left Lebanon, travelling to Paris to meet French government officials and Macron himself. Not long after that Hariri returned to Lebanon, where he announced that he would not be resigning after all. A similar dynamic has occurred on the European regional stage. Efforts to integrate Europe, including the creation of the EU, have long been led by France and Germany with the UK as an anglocentric, and more hesitant, counterweight. However, with Brexit, a major obstacle to further European integration has been removed, especially pertaining to a priority of the current French government: joint European defense. Britain has long worried that such a pact would undermine its security relationship with the Washington, and the importance of NATO. However, a push for security integration has been re-ignited by Macron’s government, after the British withdrawal in combination with Trump’s seeming disregard for NATO and pro-Russian stance. With the UK gone, France will be Europe’s only nuclear armed power, its only veto-holding member on the United Nations Security Council, and its only power with an extensive overseas military presence. A defense pact would allow it to operate collaboratively with its European allies on military issues without needing NATO’s approval. These shifts bear significance for France’s status in the world. During the World Cup final, Macron leapt up from his seat in the stadium in Moscow holding his fists in a victory grip, as joyous as a child after France scored a goal. It can be the most iconic of the French presidency—a rare spontaneous, unscripted moment for a a leader who cultivates his image more carefully than any of his recent predecessors. Further, his english speech was the first ever that a French president has given from the Élysée Palace, the seat of government, especially notable given a long term French aversion to the language in political contexts. Although speeches may seem like just words, they project soft power, thus making an impact. By using positive rhetoric and persuasion, states are more likely to meet their foreign policy goals, and become models that citizens and other states look towards. 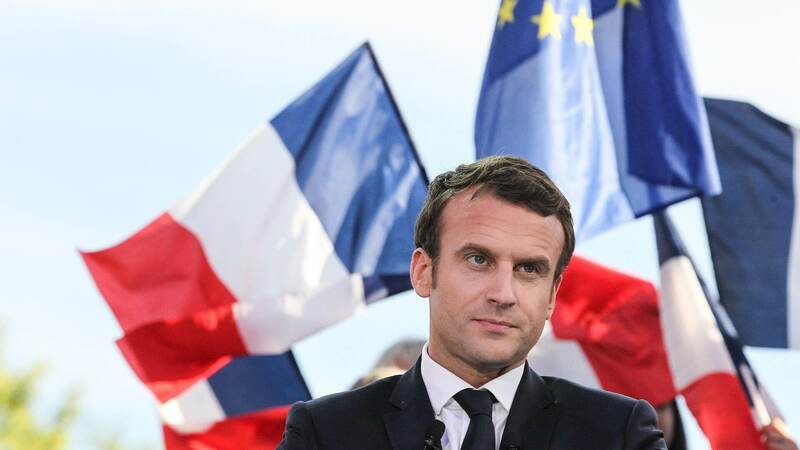 France’s outward pursuit of this soft power, in conjunction with reductions in America’s and Britain’s, have seen it rise to dominant global power status, at least in soft power terms. Furthermore, France’s expansion of its diplomatic activities outside of its normal sphere in conjunction with pursuing European military cooperation mark dramatic changes in the global order. Besides the South China Sea, France has announced plans for a state visit to Iran in 2018, something a French president has not done since 1971, especially important as the United States backs away from the Iranian Nuclear Deal, and the Saudi-Iranian rivalry drives crises such as Lebanon’s. Collectively, this unapologetic French defense of Western norms, whether through securing European unity, mediating crises, or rallying people to deal with collective challenges, means that Western priorities are receiving protection. This is especially important at a time when America, the country that in large part built the post-World War II world order, seems to be abandoning it. Ngoc Anh Khoa Doan is a lecturer at Faculty of International Relations, University of Social Sciences and Humanities Ho Chi Minh City. He achieved his Master in Asian Politics from University of London, London, UK and has always been interested in East Asian security affairs. He got his Bachelor’s degree from Canada.